I was first introduced to a book of David Meerman Scott (World Wide Rave) by Sukanti Husain (@sukanti) in April/May 2009 and have been a fan of books by David ever since. His site has been a great resource for some of my work and in addition to the books for sale, he has practiced what he preaches by giving away free ebooks on his site. So now David has got together with Brian Halligan (CEO of Hubspot) and published a book titled ‘Marketing lessons from the Grateful Dead’. Truth be told, for someone living in Sri Lanka (with interest mostly in local music) and for being born in the 80s, I had not heard of the band ‘Grateful Dead’! But after I got the book from Wiley Publishers, I checked them up on Google (and Bing for that matter) and was overwhelmed by the work that they had accomplished. I ain’t a ‘deadhead’ but have been intrigued by the ways in which they were able to satisfy their fans. This is clearly reflected in the chapters highlighted by David and Brian. We see many new artists giving away music for free but it was Grateful dead who came up with the ‘freemium’ business model way back in the 1960s! And they have been successful at it. What David and Brian have done in this book is shown how to think and market like the band, thinking of ways to market differently from the competition. In addition to the crisp clear writing, I like the “Rock On” sections at the end of each chapter which acts as an excellent guide to inspire new ideas and ways to do things differently. It felt like David and Brian were sitting next to me and guiding along and encouraging as I read each chapter. Just like with Chris Brogan’s book ‘Social Media 101’ which I reviewed last month, this book also has short chapters which makes it very easy to grasp all that is being said in the 192 pages. Each chapter focus on one element of the Grateful Dead’s marketing. In each chapter you get little orange boxes which highlight some important aspect of what the Grateful Dead had done and these can even be printed and put up on walls for inspiration. This book is clearly broken down into 3 parts with the first focusing on the band, the second focusing on the fans and lastly on the business. Just like the band choosing a memorable name, David and Brian share their own story about having a memorable brand name like HubSpot and David using his middle name ‘Meerman’ to distinguish from the other ‘David Scotts’ out there. Ahem.. I guess I am on the right track myself by using my initials W.G.T.Fernando to differentiate from the other ‘Gihan Fernandos’ out there. I have a long way to go but the start has been made. Maybe it’s not late for you to use a clear brand to differentiate yourself from the pack either. The duo talk about having ‘digital citizens’ in a company’s team and creating a diverse team like the Grateful Dead did. It’s all good advice and are worth looking into in order to sustain and be successful in this technology driven world we live in. Chapter 7 was a very heartening one since it opened up avenues by redefining the boundaries set for raising funding for a startup. David and Brian had used ‘Y Combinator’ as an ideal example in which to explain about redefining boundaries and going the extra mile to be different and making things happen. This chapter is a must read for any startup company and a chapter to watch out for traditional VC firms. The Grateful Dead had respect for its loyal fans. For e.g. they announced tours to fans first and treated supporters to the best seats. Just like the band showing a lot of loyalty to the fans, businesses nowadays should also adopt this approach. David and Brian highlight a few occasions where companies have gone the other way by only trying to gather new customers and ignoring and alienating the old ones. Great examples that can be taken from the band that can be easily adopted by companies that want to survive in the market. Talking into consideration a chapter from the 3rd section ‘Business’, chapter 15 focus on upgrade to premium. The Grateful Dead encourages people to record shows for free but also sells high quality recordings directly via their site. This approach is one which many companies are adopting where they provide a limited edition of a product for free but if want the best quality/full product, you pay a small premium. We have a few companies (http://creately.com & http://curdbee.com to name a few) in Sri Lanka as well who have adopted a similar approach. Like I mentioned at the start of this review, David has a similar approach where he has a few titles of his which can be freely downloadable, once you like his style of writing, you would then want to buy his remaining titles. A classic case of an individual showing by example. 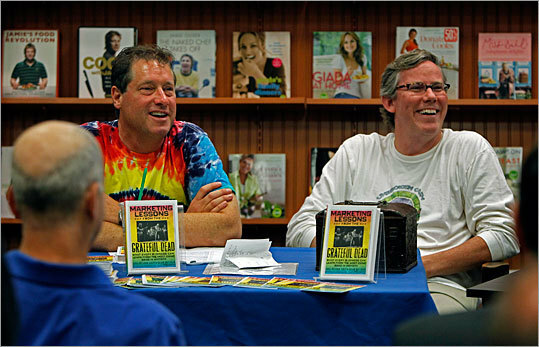 Not only is the content of the book worth the money invested, with some great photographs by Jay Blakesberg and illustrations by Richard Biffle, it amplifies its worth. So go ahead and dive into this title and pretty soon, you too will look at things differently and be a change maker. Are you up for the challenge?